Ever need a small funnel to fill a salt or pepper shaker? Don’t you just hate it when you try and fill those small containers and half your ingredients end up not going into the shaker? Well here is a useful idea for recycling a toothpaste tube into a funnel. Take any regular toothpaste tube and rinse out any remaining bits of toothpaste. I rinse my tubes out in hot water and leave it to soak upright in the sink. Then you want to cut off the end just above the end seam of the tube with a sharp pair of scissors. Rinse the tube out again and let it air dry. If it has a lingering toothpaste smell, you can rinse it out again with some white vinegar to help get rid of the toothpaste odor but it really doesn’t hurt anything if it still smells of toothpaste a bit. 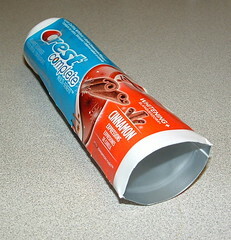 Once dry, you can now use your recycled toothpaste tube for a small funnel to fill salt, pepper, or other small-mouthed containers. The small screw end of the toothpaste tube fits nicely inside salt or pepper shakers making for a easy fill now for your kitchen cooking needs. Brilliant! Am going to be sharing this with friends and family. Thank you for sharing the wonderful ideas.